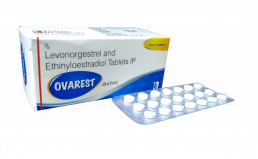 Trumac Healthcare is one of the leading Levonorgestrel Ethinyloestradiol Tablets Manufacturers Suppliers all over India. Ethinyl Estradiol+Levonorgestrel is used for contraception. This is a combined oral contraceptive pill. It works by preventing the release of egg (ovulation) and affecting sperm movement in the womb to prevent its union with the egg. It also changes the lining of the womb and renders it unsuitable for pregnancy.